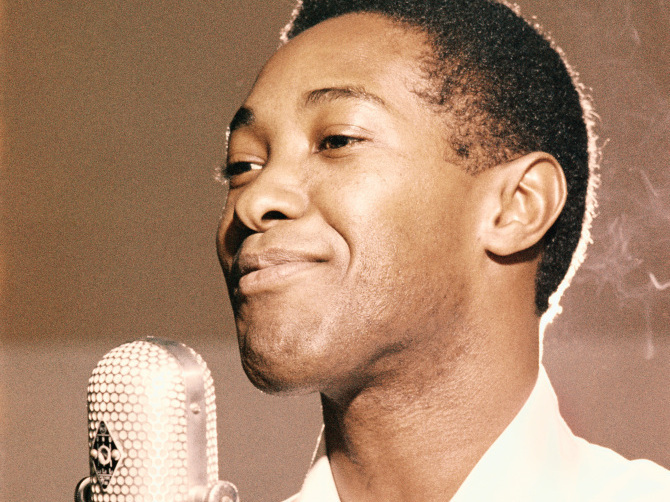 Sam Cooke At 80: The Career That Could Have Been : The Record In honor of the soul legend's 80th birthday, a few questions about what might have been. Sam Cooke in an RCA Recording Studio in Los Angeles, circa 1959. It feels strange to suggest that Sam Cooke isn't appreciated enough. Cooke, a legend of soul, has been celebrated in nearly every way a musician can. He's been included in lists of the greatest singers of all time, voted a charter member of the Rock & Roll Hall of Fame and awarded a posthumous lifetime achievement Grammy. You can still hear his songs in movies and sing them in karaoke parlors. But the adulation has an effect of obscuring what's most enduring about Cooke's legacy — that he never sat still long enough to become as big a star as he might have deserved. Cooke would have turned 80 years old on Saturday. He was a songwriter, a label owner, and a performer who "[lived] in the 'top ten,'" as his record label once put it. His was a career defined by ambition — a desire to push against the limits of his success — nearly as much as it was by the success itself. Born in Clarksdale, Miss. and raised in Chicago, Cooke's singing career began when he was just six, a standout talent in a family of gospel singers that traveled to accompany their father's sermons. He joined the Soul Stirrers at the age of 19; the gospel group, still around today, was five years older than Cooke. At 26, he ventured into the world of secular music. He brought a gospel authority to pop songs about broken hearts and puppy love. When he turned away from songs about twisting and aimed at social concerns, he did it by degrees, making a sympathetic depiction of prisoners working on the side of the road sound like a love song, or rewriting reverent gospel songs to reflect concerns and anxieties related to love or money. But think of classic soul singers, and he's not the first one that comes to mind (that'd be Aretha Franklin or Marvin Gaye). The same goes for R&B (Ray Charles, James Brown) or pre-Beatles vocal pop (Sinatra and nobody else). Cooke's hits may stay with us forever, but in some way they overshadow a monstrous career that could have been but, through accidents of timing and fate and caution, wasn't. The music that exists is worth plenty, though. No one else does so much with so little. Again, I know that sounds strange — Cooke had an enormous natural talent — but he mined a narrow vein, one in which restraint was prized over embellishment. So Cooke sang direct and clean lines, never pushing or straining his voice, always perfectly in time and tone with thoughtfully arranged instrumentals. No flailing, cathartic vocal runs, no bursts of horns, just precision filigreed with the occasional, sighing "whoa-oh-oh-oh" like the one that punctuates the chorus of "You Send Me." But it's difficult to hear his songs and not feel a nagging desire for the fulfillment of a promise that's never quite met. From those sweetly anodyne backing vocals on "You Send Me," designed to ease his introduction to white pop audiences, to his absurdly perfect pronunciation of the phrase "How are you doing out there?" as he greets the black Miami crowd at the 1963 concert recorded and released as the album One Night Stand, you can always hear the facade Cooke and his producers are building. They anticipated and played to the desires of an audience that didn't yet know it wanted to be led by the hand away from puppy love and into a relationship that burned with a little more fervor. Yes, even on One Night Stand, the album that's held up as proof of a grittiness and depth unexplored in his studio recordings, Cooke's singing is always careful, a display of studied perfection and control that's the opposite of his notoriously wild private life, his messy financial dealings, and the shocking and salacious story of the night his life ended at the Hacienda Motel in Los Angeles in 1964. The more you find out about Cooke's life (Peter Guralnick's Dream Boogie: The Triumph of Sam Cooke, a brick of a book, has answers to questions you'd never think to ask), the harder it becomes to square the man with the music. Still, I love Sam Cooke's singing as much as I love anyone's. What's the problem, then? I can only imagine Cooke's restlessness never allowed his talent to catch up with his ambition. With a few stellar exceptions, he doesn't have perfect songs in his catalog. That Cooke's songs were classics isn't up for debate. They're covered endlessly, and with nearly zero exceptions, fail to live up to his standard (call it blasphemy, but I prefer Otis Redding's version of "A Change Is Gonna Come"). And yet, to listen to a Sam Cooke song carefully, to hold it close to you, is to feel a shred of disappointment, in his choice of songs, in their subject matter, for the fate of a life cut short. The issue may be one of historical perspective. The Sam Cooke in my mind contains multitudes: gospel hero, teen pop idol with white America on a string, soul heavyweight with a vibrant political consciousness who heard Bob Dylan's "Blowin' In The Wind" and couldn't restrain himself from penning a civil rights anthem that matches in bruised hope what Dylan laid down in righteous sarcasm. But Cooke lived these personae in series, not in tandem; it's the deification of the man's talent that accordions history. To make an argument out of a historically jumbled metaphor, imagine a singer moving from the peaks of gospel to teen dance pop to political folk — Kirk Franklin to Cali Swag District to Bob Dylan — within a few short years. So it's a paradox, but a rewarding one, that in his best recordings, Cooke can almost eerily flatten time. He can make you feel two conflicting emotions at once — and then recognize in that conflict the tug of a third, something that I can only identify as awe for his abilities. My own favorite Sam Cooke song (my favorite anyone song) is "Bring It On Home To Me," a 1962 Cooke composition that was a hit when it was released, and has been covered by a list of greats that includes Aretha Franklin, Otis Redding, Paul McCartney, John Lennon, Rod Stewart and the Faces, Van Morrison, and more recently, Spoon's Britt Daniel (whose own "Anything You Want" is a rewriting of Cooke's song and the most heartbreaking thing in Spoon's catalog) and the Decemberists' Colin Meloy. Cooke's version is one of those few perfect recordings from his catalog. "Bring It On Home To Me" is a heartbreak song, with perfectly chosen lyrics and a structure that wobbles between verses and choruses so short and strong that one nearly leans into the other. It's sung from the perspective of a lover whose partner has already departed — it's too late to convince her to come back — but is so blunt in its desperation, and so clear in its depiction of desire, that you can almost imagine her returning. Or maybe it's a song of reconciliation, and that touch of jubilation in Lou Rawls' call-and-response backing vocals mimics the memory — like a gentle, shared joke — of the time they spent apart. Maybe she's already come home. Of course she has. If she hadn't, who would be there to hear that lovely voice?